As January comes and goes, it seems, for many in my industry anyway, that the New Year doesn’t quite get underway until the Taboo Naughty.. but Nice Show unleashes upon us. For those managing booths or performance, the weeks preceding very much resemble those of the hectic holiday season. 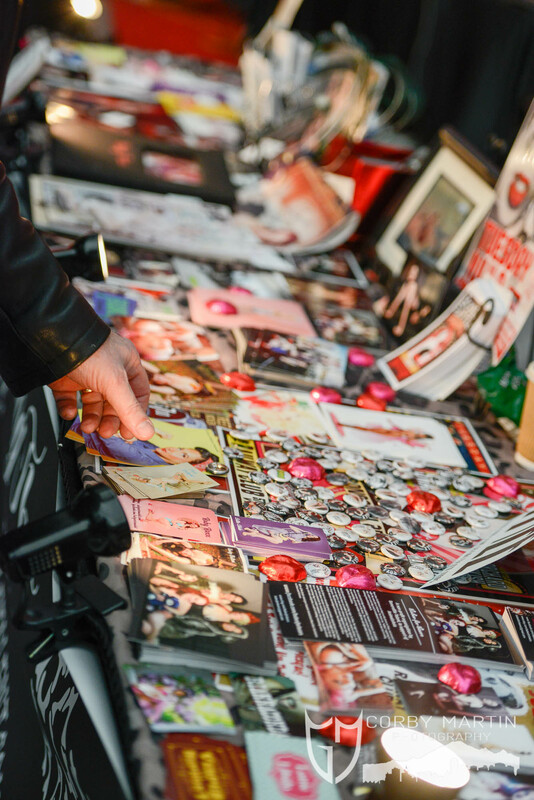 Schedules, supplies, and merchandise dominate the “to do” list, even blessing a few with the tasks of organizing wardrobe, music, and choreography. Some guests buy tickets, some are given or guest listed. There are those filing in through the VIP table, and then those who walk in a flurry, more than likely dragging a bag or two behind. As usual, my role landed in the bee hive working the event. The suspected slow evening proved absent as our booth buzzed with conversation and busy hands. I was stationed next to Stela Licinda, a lovely multi-talent with a pretty face. Set up to the back of the venue, our table allowed a work space with primary peeking on the main stage. It would be here that we considered home base for the next four days. My first wee break provided time for a rushed tour. Skipping most of the sales booths, I found myself (as always) drawn to the dungeon and art center(s). Aware of the canvas by Lance Holroyd, specifically shot for this event and display, I was surprised to see my face once (or four times) more as I turned around to the nun I created with Shimona Henry. 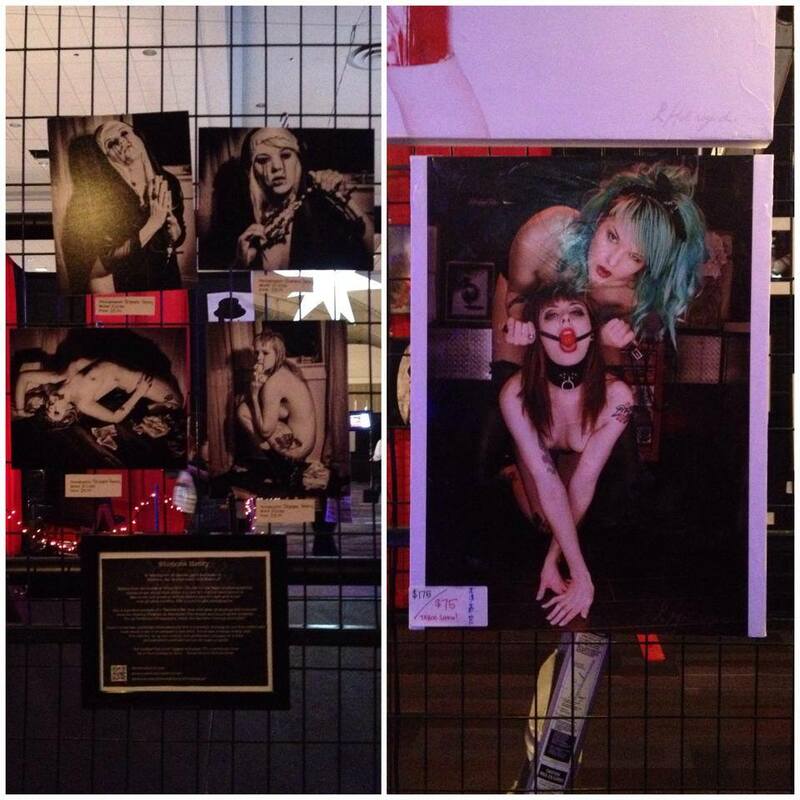 (left) nun, shot by Shimona Henry (right) with Kyla, shot by Lance Holroyd, sold. Saturday and Sunday brought the last double booking for weeks, as fashions took the stage. Bonerattle Talent’s manager, Teresa Marie, organized a large number of girls to walk for five local stores, showcasing items one may entice while on the hunt to vamp up their wardrobe, to engage one’s pulse to start racing. I joined the other models in painting face, taking on the character designed for me. Fitted a week or so before, I now found the beautiful baroque dress hanging back stage. Pulling out the pearl and lace accessories, Riannaconda helped me lace up and pin the cotton candy pink wig. Adjusting stockings, buckling straps, and pulling on the cream kimono, I picked up my freshly iced cake and bounced with jittery nervousness before my turn on stage. We had one minute to showcase the garments we wore, watching one, then the next, and the next lady step up the stairs. Vesper Sephony opened in Shiverz Designs, followed by Deadly Couture Latex, The Cake Hole, New World, and my group, always happy to reference the rear, in detailed costumes from Boo La La. Rounding the stage for our final walk Sunday, the final line up of models stood as the host wished Bonerattle Talent a happy first birthday. Knowing that the next day was also the birthday of Bonerattle manager Teresa Marie, Dixie Delight and I began to sing, hearing it pick up across the room. I couldn’t help but share my sweet stage prop, finger and all! As exhausting as the weekend was, I can never seem to find too much complaint in it. A pleasure as always, working with Shimona, the PUP girls, Bonerattle, and Dani Barnes from Boo La La. Continual laughs and smiles, bumping butts all weekend with Stela, and selling not one but two pieces of canvas with my face on it! (One signed and in a happy home, the other to be shipped to the US shortly.) Wrapping up the weekend with hugs from some very special people and rope suspension in the Sin City Fetish Night dungeon, I conclude this venture a success, waiting patiently for next year.